Gerry Speno, executive producer at Fair TV, mans the camera at a live broadcast of a budget hearing. Live, from Fairfield, it's ... the Board of Finance? Yes, and the Board of Selectmen and the Board of Education and the Representative Town Meeting, as well. 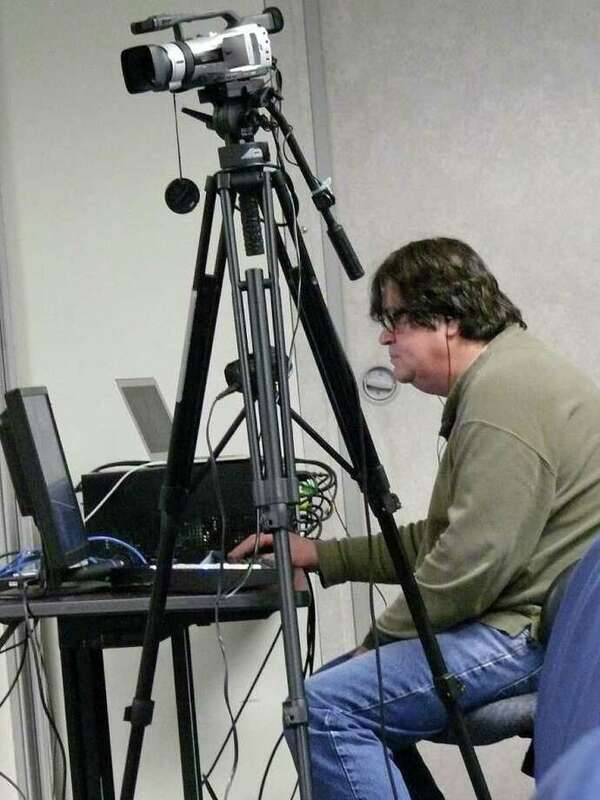 Fair TV has launched live broadcasts of those four "core" town government meetings, so residents can now check in on the business being done in their name by town officials from the comfort of home. The sessions can be seen on Channel 79 via the Cablevision service. James Kennelly, chairman of Fair TV, said those meetings are broadcast live because of where they take place. The first-floor conference room at Sullivan Independence Hall and the Board of Education's meeting room have been wired to allow the broadcasts. Eventually, Kennelly said, they hope to also offer live streaming of the meetings online. On-demand broadcasts are currently available online of taped meetings, and meetings held in other locations will continue to be taped for later broadcast. "What we're doing at Fair TV is we are building the car as we drive it," Kennelly said. The whole operation, he said, is basically himself and executive producer/cameraman Gerry Speno, and an intern from an area college. "It's about as lean a system as you can get," Kennelly said. Fair TV is funded through grants from the Public, Educational and Governmental Channel pool via Cablevision. First Selectman Michael Tetreau has recommended an allocation in the 2012-13 town budget of $25,000 for Fair TV. In his budget highlights, Tetreau said Fair TV has become part of the town's culture and a cornerstone of open government. "It gives everyone a front row seat at the meetings of so many of our town boards and commissions," he said. Tetreau recommends that a commission be approved and authorized to set priorities for the spending of the town funds. Fair TV can be accessed online at http://fairtv.pegcentral.com or via a link on the town's website, www.fairfieldct.org. Government meetings can be viewed on Channel 79 on the Cablevision system.